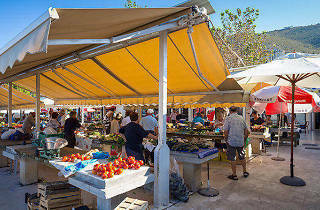 The main market in Dubrovnik for fruit, vegetables and, alongside, fish. In a section of the ruined garden of the Gundulić summer villa, Gruž market is larger and cheaper than the one in the Old Town Gundulićeva poljana. Shoppers and occasional restaurateurs arrive here, near the ferry terminal, from early in the morning, hoping to find the best goods. 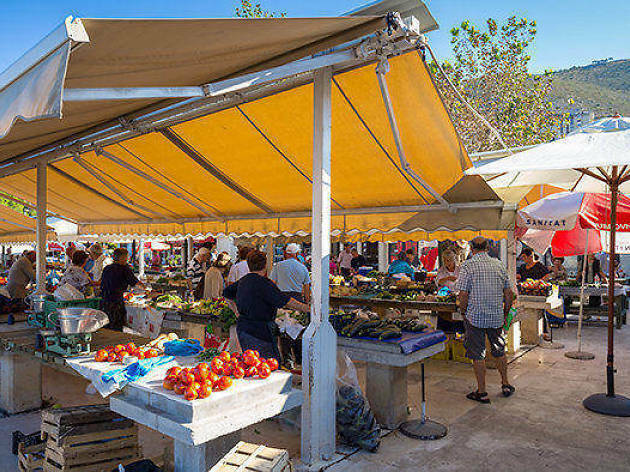 Few words are exchanged with the vendors, who have come down from the Neretva delta, Konavle or Herzegovina over the border. With a little luck, locals find the best cabbage for zelena menestra (cabbage, smoked pork and potato), goats' cheese for salads, the best eggs for rožata (the local version of crème caramel) and, for traditional Ragusan orange cake, oranges from Lopud. Prices are mostly fixed and haggling doesn't tend to happen. A little discount might be easiest at the end of the working day, when vendors are looking to offload all their stock. If you are fond of fine fish, get here by 7am, when women arrive from the Elafiti islands. The stock varies from day to day, but Fridays is usually the best. Although everyone here moans about the cost of living these days, the most expensive fish, starting from 100kn a kilo, quickly vanishes.